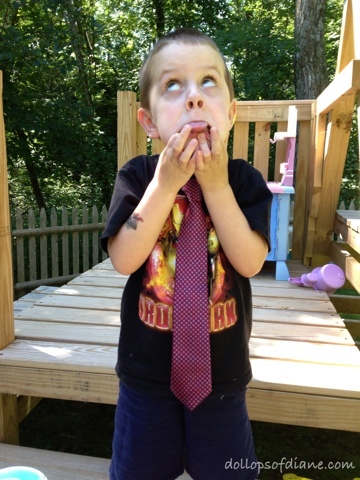 For Henry's last day of school ceremony he insisted on being "fancy" and wearing a tie. No problem except that he doesn't own a tie. How many four year olds do? I assumed he would forget about it but when he didn't I borrowed a tie from a friend. He proudly wore it (while sporting Spider-Man flip flops) at his ceremony. But the tie obsession didn't stop there. He continued to ask to wear them long after I returned the borrowed tie. After spending some time on YouTube researching how to tie a tie, I then let him wear my husband's ties for a while. 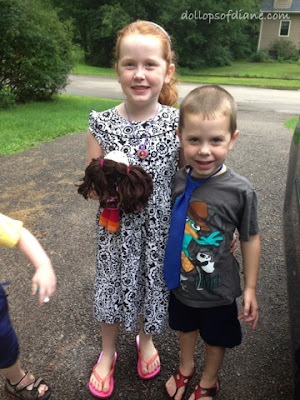 But alas, the phase didn't end so I gave in and bought him a couple of ties of his own. He loves them and wears them all the time. I'm not gonna lie - it's a pretty cute phase! 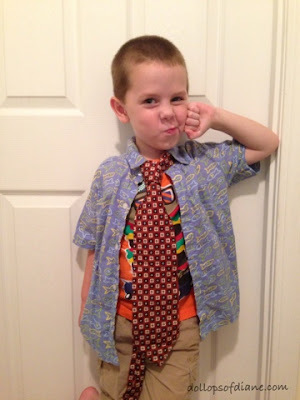 Cool dude wearing one of his dad's ties! Anyone else have a tie lover out there? What about another "odd" accessory? King Richard's Faire: Ticket Giveaway!